Basic Information: What is Maxi Hair Plus? This is a detailed review of Maxi Hair Plus which is a miracle product for hair. Maxi Hair Plus will make you nails, hair and skin healthier. It will make your hair shinier and silkier, your nails stronger and longer and your skin softer and glowing. It is especially good for vegans as it is made from vegetable sources. Pyridoxine HCL: It is a source of Vitamin B-6. Ascorbic Acid with Rose Hips: It provides Vitamin C.
D-Biotin: It provides you Biotin. D-Alpha Tocopheryl Acid Succinate: It provides Vitamin E.
Retinyl Palmitate: It gives Vitamin A.
Thiamine HCL: It supplies Thiamine (Vitamin B1). Riboflavin: It supplies Vitamin B-2. Maxi Hair Plus is free from wheat, soy, milk, artificial color, artificial flavor, artificial sweeteners, magnesium stearate etc. 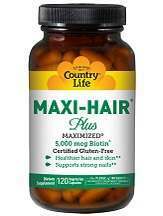 Take 4 capsules of Maxi Hair Plus per day, preferably with meals. A single bottle of Maxi Hair Plus is available at a new discounted price of $17.40, instead of its old price of $28.99, this means that you get a discount of $11.59. I have been using Maxi Hair Plus for 6 months. I am taking 4 capsules a day. I am 60 years old and my hair was thinning because of menopause. I also have a family history of hair thinning. I am amazed that the hair around my crown has grown out at least 2 inches within 4,5 months. It used to be sparse, but it is starting to look fuller than before and I am not losing much hair. I am very happy with the results. I will be taking it for the rest of my life. I am aware that I will never have my old hair back, but I am pleased to see that my hair is starting to come back. If you are a nursing mother, pregnant, taking medication, diagnosed with a medical ailment or planning for a surgery, consult your physician before using Maxi Hair Plus. It is not recommended for people who regularly consume liver. If any side effect occur, stop taking it immediately and consult your physician. The manufacturers of Maxi Hair Plus do not offer any money back warranty. There are a few customer reviews about Maxi Hair Plus, however these reviews are very positive. Hence, Maxi Hair Plus is a wonderful cure for people suffering from hair loss. It is easy on the pocket and has good customer reviews. However, it does not offer any warranty and monthly or annual subscriptions. It takes time to produce results.